Legendary singer Mohammad Rafi had a 36-year-long career. But till 1991, there was no clarity on the total number of songs he sang. If we go by the articles and programmes on Rafi in the media, this number is somewhere around 28,000. However, this seems unrealistic, as 28,000 songs in 36 years means that Rafi sang an average of 777 songs each year. Out of the 36 years, if we subtract the years between 1970-76, when Kishore Kumar emerged as the most popular singer and Rafi did not get many singing contracts, the average comes to about 1,000 songs a year. This means 2.74 songs per day. This is not humanly possible. Lata Mangeshkar’s name had first figured in the Guinness World Records in 1974 for having sung the maximum number of songs in the world. She was credited with singing about 25,000 songs. However, Rafi was convinced that he had sung more songs than Mangeshkar at that time. So, in a letter to the Guinness World Records in 1977, Rafi challenged the claim. In 1984, four years after Rafi’s death on July 31, 1980, Guinness World Records declared that Mangeshkar had the “most recordings”. But it also stated: “Mohammad Rafi claimed to have recorded 28,000 songs in 11 Indian languages between 1944 and April 1980.” In the 1987 edition of the Guinness Book of World Records, the number of songs sung by Mangeshkar was increased to 30,000, perhaps to surpass Rafi’s claim. His name was also mentioned till 1990. But this was based on newspaper articles, not on verifiable facts or any detailed list of songs. But an event in 1991 changed all of that for good. By 1988, Harmandir Singh Hamraaz of Kanpur, a researcher of film songs, had published the first four volumes of an encyclopedia of film songs during the period 1931-1970. Hamraaz’s fifth volume covers the period between 1971 and 1980, and it was released in Bombay in 1991. Based on the information in the encyclopedia, the media started printing articles about the actual number of songs that Mangeshkar had sung. There were 4,500 Hindi film songs till 1980 and about 5,250 till 1991. Even if one added her non-filmi and non-Hindi songs, the total would not have exceeded 6,000 songs till 1991. Guinness World Records took note of this news and asked Mangeshkar in 1991 to prove her claim of having sung more than 30,000 songs. Mangeshkar could not give any documentary proof. She could not point out any song sung by her which had been omitted in the five-volume encyclopedia either. Consequently, the names of both Rafi and Mangeshkar were deleted from the Guinness Book of World Records in 1991. The title of most songs sung went to, incidentally, Asha Bhonsle, who had sung more than 10,200 songs by then. Thanks to Hamraaz, it was now easy to ascertain the exact number of songs that Rafi sang in 36 years. It is now established that he sang 4,525 Hindi film songs till his death in 1980, which were more than the number of songs sung by Mangeshkar till 1980. If you add his 112 non-Hindi film songs and 328 private non-film songs that have been documented, the total becomes 4,965 songs. So the truth is that Rafi never went beyond 5,000 songs (if we take into account some songs that were not documented). However, this does not discredit Rafi in any way. Rather, it goes to his credit that even with 5,000 songs to his credit, Rafi remains one of the most popular singers till date. Incidentally, even Mangeshkar hasn’t sung more than 6,500 songs till date. Increasing the number of songs of their favorite playback singers by fans and the media does not do any good to the singers’ reputation. Kundan Lal Saigal sang only 185 songs, yet he is very popular even today. It is high time that fans, music lovers, media, scholars and researchers get their facts right. This entry was posted on Sunday, September 23rd, 2012 at 3:49 pm	and is filed under Meri Awaaz Suno. You can follow any responses to this entry through the RSS 2.0 feed. You can leave a response, or trackback from your own site. Md.Rafi is singing of nearly ,35,000 thouands of songs . but here mentioned only 28,000.Why? Is good Singer, Good Men,& Good nature of men.Now.Is vioce is not found it. because He’s vioce real voice. That is Allaha is give gift to me, many times say that time. He say time to time ,I am singing lots of Songs. but book says other Why? No cheating here. I would urge upon Manishji, kindly to enlighten me in which interview Lataji did air her opinion in favour of Kishore kumar, comparing him with other great singers? If so, was it before 2010? since if Manishji is correct, then has she not corrected herself by hailing Md Rafi to be the greatest singer in a full article published in Hindusthan Times in 2010? In response to Manishji’s comment I would like to say that, it is not correct to say that Lata preferred Kishore’s voice to Md Rafi in an interview. It is highly debatable, since most of the Md Rafi admirers know that in an article in Hindusthan Times (I forget the exact date ) in 2010, Lataji declared clearly that according to her perception, Md Rafi is the greatest Indian playback singer till date. Moreover, she also mentioned that having sung with all major singers of her time like Kishoreji, Hemant kumar, Mukeh, manna dey and Talat mahmood, she found most exciting the experience of singing with Md Rafi sahab. And how can one conclude Kishore kumar to be the most popular singer in the present days? While recent polls in Outlook magazine made it crystal clear that Lataji and Md Rafi to be the most popular singers in the opinion of 30 experts musicians as well as the result shown in poll.In my opinion, there should be more reflective articles in newspapers along with websites on this particular issue since young listners should be enlightened about the greatness of golden era songs, and edge and superiority of Md Rafi and Lataji above all other singers including Kishoreji and Ashaji as well. In very poor taste, this article has made me wonder whether to continue being a part of it. however, as many of our friends on the forum have indicated, quality is more important than quality. i refuse to participate in political discussions. Buntyji,please read my post 74 if you havenot so far..
kishore fan…tumchi asha tai also said that Sanjay dutt sings like Kishore Kumar, i think that says it all. writer of post 62 – i am surprised specimens like you still are around. post 75 – many dogs would be offended for they are very intelligent and faithful. Post 65…. you are right. Kishore kumar was a good singer. he could have become great ‘but’ for his hoarse voice and his habit of running away from the studios if a difficult song came his way. remember that he was discarded as a singer and he had to fend to acting and other arts – for more than two decades. the songs of mukesh, manna dey, talat mehmood and saighal are more popular today. Kishore Kumar due to his limitations in singing regarded K L Saigal and Mohd rafi as his guru. Pls do your homework and then take the pen. the KK website is dying. pls pour some water there occassionally. Pl keep the dog kishorefan who is barking without invitation. I believe it is high time we stop commenting on kk or comparing rafi with kk.we should remember that this website is for praising rafi and not for bashing kk. people are free to like whoever they want and we cannot force them to like someone we like.if someone favours rd over naushad, or nadeem shravan over arr, can you stop him, no.if someone favors asha over lata, can you stop him, no..let them like whoever they want to.but i pity who who can’t distinguish between good and bad. popularity and lack of it are subjective and depend upon various factors, but let us not forget that popularity is only a temporary phenomenon and is not a measure of a person’s greatness or calibre. as far as lata ji’s interview is concerned in which she has named kk as her fav singer, i really doubt if she really meant it. and i have some reasons, first, rafi was bigger than her and was her closest rival during the golden period of hindi film music.. and can you believe this, in the same interview, she names sajjad hussain as the most talented and fav music director !! she, very conveniently avoided taking names of naushad, madan mohan and shankar jaikishen..
if range, voice quality, no. of years at the top, no. of hits and acceptability by the music directors are taken as measure of one’s singing greatness, i believe no one can take the crown away from rafi, not even lata, forget kk. I feel that the voice qualities of Rafi Sahib & KK can be compared with two different kinds of foods (i) Rafi sahib’s voice & its quality is like a home made food,which is full of nutrients, fresh,healthy, prepared with love & affection & can be taken for longer time with different taste & pleasures(ii) whereas voice & quality of KK is like a food of a Dhaba, which in first look seems to be more palatable & tasty & can be eaten to have a change of taste. For few days, it can be eaten with pleasure, but after few days or so, you will feel disillusions,as it would have already harmed your digestive system. Because food was substandard & with imbalanced food constituents & spices. So ultimately, we again will have to look for a home made food. The songs of Rafi Sahib is just like home made food, thus can be taken for the life time without any harm with different taste for each day. Whereas songs of KK are of short span, having same taste for each day,as gravy of different foods is same & thus can be taken for just a change for a while. I fail to understand one thing.While i know that Rafi saab was the greatest,why do we try to reason it out against KK in every second post.Let us forget abt KK, he is a non entity.There is no point in comparing the Sun with a temporary star which could shine only with the help of another brighter star RDB. btw..does anyone have a news abt Shahid Rafi’s next move.I last heard abt it on 27 Sept only. i share your anguish since I too had the ‘same experience ‘ some years back in dubai. the great rafi saaheb lover farouk opkar was on leave that day and one charu something put all rotten songs on air. i called them up and complained to the station the same day. kya karre. anaadi log duniya me bahut hai jo radio station me kaam karte hai aur sangeet ka a, b , c, d bhi nahi jaanta hai. in dubai we used to glue to the radio sets most of the days and ‘more’ on July 31 and Dec 24 with our coke next to us. we were also lucky that mr faroukh opkar who carries a mohd rafi picture in his purse – used to call us and ask for ‘song request’ on occassions. faroukh rj used to play mohd rafi songs from 9 pm to 12 pm and dubai people got used to listening to rafi saab songs and retiring for the day. Its in material about numbers, it all comes down to genius. Mohammad Rafi was one in millions and there will be no-one on earth to ever take his place. I say thank you god for this life and being born when i was, how eles would i have been lucky enough to hear that magical voice. It was my dad that first introduced me to the wondeful voice of Rafi when i was was in my late teen and to this day no-one has and i know no-one will replace the amazing singer. We should all be grateful to god to have lived this life and shared a piece of true Rafi magic. for which film rafi saab had given playback for Kk. a friendly relationship was there between them. yesudasji told about the styles of singers of north and south. did not mention the name of kk in his speech. Dearest Kishorefan give me link of one interview where Asha ji or Lata ji said that Kishora is greatest singer, what said by they even we mohd rafi fan say about Kishore da he was a great actor and also a good singer…………….. It is you people who have passed comments against kishore kumar, no kishore fan has done that. And a fitting reply has come to such comments. As long as you are straight, no comments have come from any kishore fans. My previous post is very clear and neat, you people better understand the essence of that. Sorry to say, but again why is the editor encouraging such morons like kishorefan, who just want to stir up some issue and enjoy the fun,.I appeal to all rafians not to react to such idiots as it is not needed since both singers are no more with us.We need not react to such fools to prove the greatness and superiority of rafi saab. for your idol is just like ‘sahara dessert’. Well , same people are calling lata mangeshkar and asha jealous, who infact have said truth about kishore kumar – then what should be told of these people, who are feeling jealous of kishore kumar’s popularity. The “Light” is always visible, one need not be shown the light and its visibility. Kishore kumar need not be projected, he is the light. Rafi fans are struggling to maintain rafi’s popularity by consistent effort. Kishore kumar is popular without any effort by kishore fans as being projected and agreed (which is true) by rafians here. What about rafi – so much effort by these people to maintain his popularity ??? by writing comments about rafi saab. thank you rafi saab and long live rafi saab. It is ridiculous to count stage songs and private mehfil songs. it is unthinkable from Rafi. Is there any confirmed record that how many songs Lata, Asha and Kishore sang till 1980. It is unbelievable that Rafi sang less nos than them. Rafi saheb greatness, he is no more but there are Rafi shows all over the world at any given time. Lata anniverasry had only 2 programs in Mumbai and Asha 1.
post # 53 Mr.Ahamed Kutty, I totally agree with you regarding Kishoreda’s site coming to an end. Our rafi sahab loved and admired all his co-singers famous or not. so being a die hard rafian, I also like kishoreda’s songs alongwith other singers of the golden era. I was going on kishoreda’s site from time to time. But the last entry is from August, 24/2011 When Dev sahab passed away I went to see if something was written about them two-nothing. Then with rajesh khanna’s passing away I went again to find nothing. Maybe, they are busy thinking to come up with some mud slinging at the great one. Again, brother you are right they don’t have any new topics/subjects, but dev and rajesh both who made kk famous were forgotten by his fans. sad very sad. Even our rafi sahab had praised kk so many times on his singing as well as him being very funny. RIP rafi sahab and kishoreda. Sorry sir again i do not agree by ignoring such acts we cannot shut our eyes and ears to what is going on. I request all of you post your feelings and you all have very good knowledge of music and i am a naive person you can make them understand what rafi was i am doing it at my own level in my office I have made a circle where i circulate my knowledge of Rafi saheb and though this circle is small but people appreciate whatever i write and i get their responses immediately this encourages me to write more. Writing always help not only in this forum but in forums where those who don’t know much about Rafi and his brand of music understand his music and his nature . It gives me immense pleasure to tell them whatever I know about Rafi sir. Therefore I request these esteemed colleagues of mine not to shut eyes to these developments but raise voice and make our presence felt there it will definitely help as i am seeing some changes As i m seeing some more songs of Rafi saheb being played but still very few as compared to Kishore. we can ask them why other singers are not being played without naming anyone why other musicians are not being presented to new generations. You are doing a good job by popularizing golden Era but tell them which is golden Era . Anyone can write on their Face book i have been writing if more people join in we can get it done after all These FM Channel can’t ignore a big public demand. their rating also depend on their popularity. May be it is possible someone is influencing them all this we will know if we start probing them. Post some good write u bout rafi saheb and his association with top class music directors may be RDB or lamikant Pyare lal . RDB is their favorite, rafi saheb fan following is immense compared to kishore let us make them understand who is Rafi saheb. moreover fm channels are avialble only in city limits. rafi saab’s songs more than that of other singers. she is getting in her hand. In all voting done online Rafisahab is the most popular of all singers and majority of youngsters go online. I became the fan of Rafisahab at times when the popularity of kishore was at its peak in early 70’s and most of my friends from that era were all fans of Rafisahab. Most children in my family and those we know all enjoy hearing Rafisahab. Filmfare awards are popular awards and Rafisahab, Mukesh, Manda Dey, Chanchal, Yesudas and Mahendra Kapoor got these awards in the 70’s. Jump on you tube and see the millions of hits on songs of Rafisahab, all these are youngsters. All India Radio used to play more songs of Rafisahab compared to any singers even in the 70’s and even now every third song played is a Rafisahab song. Sadly some pockets of the media are either completely ignorant or suffer from identity crisis. Some of them believe just because they are from a particular background, they have to appease singers and artistes from that background or region. The example Sunil ji has mentioned in post 53 is the kind of naive people that i am hinting at. I think we must ignore such specimens. If tomorrow a mad scientist claims he has developed a bulb that gives more light than the sun, what would we say about such nut? sure someone there behind all strategies to make kishore popular. after mahatma gandhi” and what others have. failed in all other ways. The common thing between Lata, Asha and Kishore is that they are all overrated by a mile. Salim ji, your points in post 47 are spot on. 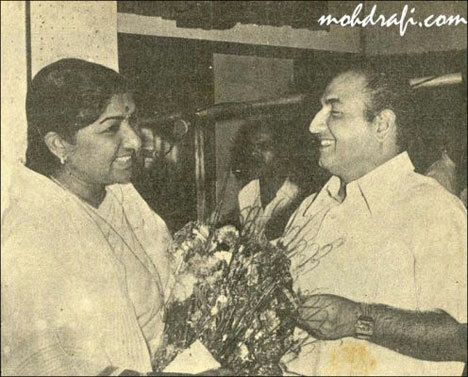 It is clear from all Rafi/Lata duets on how she struggles in every song. She has ruined many songs including the one i am listening ” veeran mera dil hai” from lootera. She is screeching in the song and takes a lifetime to get the range whereas Rafi is all sublime and sings the song with ease , beauty and melody. Sunil ji – bandar kya janne adrak ka swad, these people dont have the ears for taste or they are simply ignorant of the great history and singers of HFM.